An early step in this process is the croquis (Fr. cartoon) produced by the fabric stylist. He or she usually has a great artistic eye as well as knowledge of what is possible with today's printing technology. Often the ultra fine lines in some historical fabrics are not reproducible. In the 18th and 19th century the tiny details were etched into copper plates or rollers. Today you can not cut silk screen that finely--it will just fall apart. Here is an example of a fabric stylist's work. The drawing on the left is a tracing of the actual antique sample, upper right. The fabric stylist expanded the initial tracing to include the repeat of the two motifs--vertically and horizontally. The lower right visual is the croquis--an artist rendition of the reproduction-to-be. Notice the slightly larger stamen on the lower right flower (the edge of possible with today's technology) and the poor registration of both the blue and red above the stamen (we can reproduce this 19th century 'error'). Once the croquis is approved, the images are transferred to the mill and the silk screen is cut. Here are two croquis from my newest line, Little Pink Stars. The colored squares below the fabrics are the 'paint' used. If I would want to lighten the deep rose color on the right hand double pink, the artists knows which 'shade' was used and then is able to update the croquis. I had a lovely time in Arizonia--it was warm and sunny, unlike Montana! Last Sunday I was at Zoe's Trunk in Chandler, AZ doing my Peek at the Past lecture. I brought the Dargate book with me and everyone got to see all the samples on all the pages. I am including some scans of those pages for those of you who were not there. The shuttle driver was telling me about the 4 C's that have historically been the economic drivers of the Phoenix area--Citrus, Cotton, Cattle and ? I have forgotten the 4th. Does anyone know? All of these are now trumped by the most important C of all--Climate. I am on vacation in lovely warm and sunny Arizona and brought along another Album Block image for your enjoyment this week. Note 3 different mousy brown prints. Autograph albums filled with not only autographs but also poems and sketches were especially popular here in America in the 1820s. 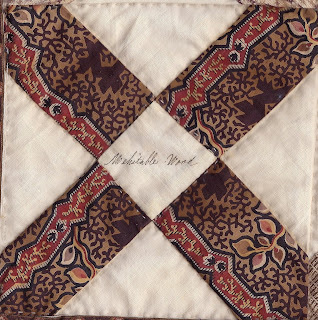 This fad translated to quilting in the 1840s with a variety of Album blocks containing signature, verses and sometimes even tiny sketches. This also was with a time of westward migration in the country. Women would often collect signed blocks from their family, friends and neighbors. These blocks and the Friendship quilts made from them were treasured reminders of a community left behind. In this 5 1/2" block, you can just barely see the background shading in the print. In the 1830s, a new mechanical printing technique developed to create a design on fabric in which the ground color was shaded or washed in different intensities of the same color. The colors could have a smooth gradation or ripples and zig-zags. When this was done in changing colorations it was called "a rainbow print". Sometimes the stripe was then overprinted with a floral or bias plaid design. These prints were called by various names including "Ombre"- the French word for shaded or tinted or "Fondu" French for melt or dissolve.